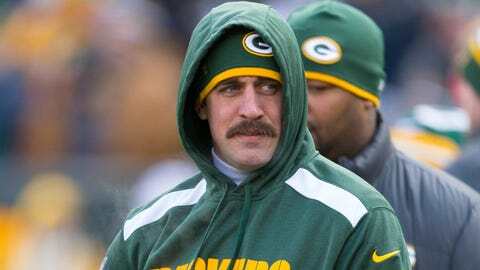 Packers quarterback Aaron Rodgers looks on prior to the game against the Minnesota Vikings earlier this season at Lambeau Field. GREEN BAY, Wis. — Green Bay Packers coach Mike McCarthy confirmed FOX Sports Wisconsin’s earlier report that quarterback Aaron Rodgers will start Sunday against the Chicago Bears. "We’re preparing for the Chicago Bears with Aaron Rodgers as our starting quarterback," McCarthy said Thursday afternoon. Rodgers has missed the past seven games after fracturing his left collarbone Nov. 4 in a loss to Chicago. Rodgers has been practicing in a limited fashion in recent weeks, but the team had yet to medically clear him. However, neither McCarthy nor Rodgers would comment definitively on whether that medical clearance actually came this week. "Aaron has accepted the level of risk for this," McCarthy said. "This been a stressful period for him. I think he’s just relieved to play. And, frankly, I know from our conversation this morning, it’s time to play football. This situation, his situation, particularly out in the media, the focus on our internal talks has been discussed thoroughly over and over and over again. "He just wants to focus on playing football." For the first time since his injury, Rodgers was listed as a full participant in practice Thursday. Rodgers didn’t think it was "appropriate" for him to discuss whether he’d be wearing extra padding around the injured collarbone area. He also wouldn’t get into specifics as to how the conversations with the organization went that led to him being allowed to play. "I read a great quote by Kobe (Bryant), actually, recently," Rodgers said at his locker Thursday. "He was talking about his injury and how when you’re injured it heightens, kind of, your awareness of that injury. But when you get back on the court or the field, it’s all about performing and trying to block that out. I think that’s the easy part when you’re out there. "It’s easy to talk about it with you guys (media members) and understand the risks. But when you’re out on the field, it’s about performing and playing and not worrying about it." Rodgers is back just in time, as the Packers (7-7-1) can win the NFC North on Sunday with a win over the Bears (8-7). Without Rodgers as the starter, the Packers went 2-4-1. "We’ve got the best player on our team back in, but just because he’s playing don’t guarantee nothing," wide receiver James Jones said. "We’ve still got to go out there and play football, play it a high level in all three phases and we’ve got to win."